In early July 2012, observers began to notice that Kim Jong Un, then only recently-promoted to North Korea’s top job after the sudden death of his father, was being frequently seen in public in the company of a mysterious, good-looking woman roughly his age. At that time, most suspected that she was his wife or girlfriend, but unusually for North Korea, the mystery did not last long. Very soon, in late July, DPRK official media openly referred to her as Kim Jong Un’s wife. Her name was made public, too: as everybody knows now, the North Korean leader is married to Ri Sol Ju, a former singer, musician, and cheerleader. 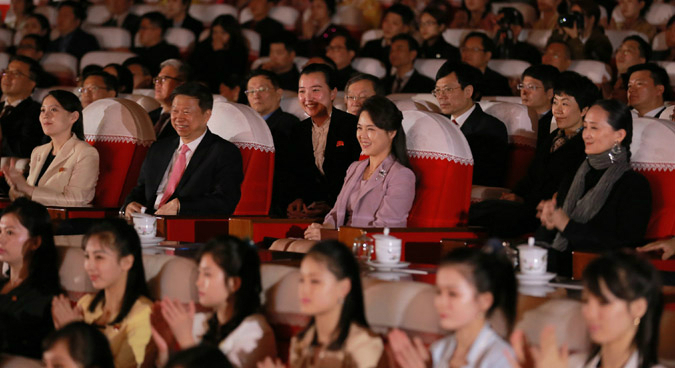 By North Korean standards, the sudden public appearance of the leader’s wife was a very unusual sign. Historically, wives of North Korean leaders have, with some exceptions, never been public figures. Kim Il Sung was married at least twice. It seems that he also had quite a number of mistresses and girlfriends. 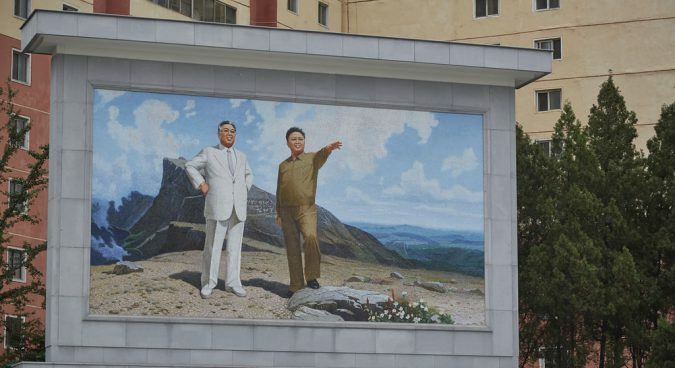 However, few people understand that Kim Jong Suk’s prominence is both posthumous and recent: until the late 1960s, she was seldom, if ever, mentioned in North Korean publications. Her posthumous fame is largely determined by the fact that her oldest son, Kim Jong Il, was eventually chosen to become the hereditary ruler of the country. Kim Jong Suk died in childbirth in 1949 and soon the Great Leader, as Kim Il Sung was often referred to, married his secretary Kim Song Ae. The public learned about her existence only in 1965 when she was mentioned in the official press, and in the 70s, she briefly enjoyed a measure of prominence, being – for few years – even chairwoman of the Korean Democratic Women’s League. However, her prominence was, once again, related to a power struggle between possible successors. Kim Song Ae’s sons, for a while, were seen as potential heirs. They were pushed aside by Kim Jong Il and were eventually sent to a comfortable diplomatic exile overseas. Kim Song Ae also moved away from the public stage after her branch of family lost the struggle. Kim Jong Il, the second ruler of the Kim dynasty, was a remarkable womanizer. It helped that he was popular with women, who liked his charm, humor, and personal kindness (it helped, of course, that he was a prince, but he was a Prince Charming). However, Kim Jong Il never really never bothered to enter a proper formal marriage. He had a chain of live-in girlfriends, one of whom, an ex-dancer, gave birth to the current North Korean ruler. However, none of these women has ever been mentioned in the media and the vast majority of the non-elite North Koreans have likely never heard their names. From this point of view, Kim Jong Un’s attitude is quite remarkable and unusual. Without venturing into the dubious field of pop-psychology, I would suggest that Kim Jong Un’s attitude to his wife and women, in general, was possibly influenced by his father’s enthusiastic womanizing: he may have seen his father’s behavior as reprehensible and likely decided that he would behave differently. If becoming a good family man was his intention, Kim Jong Un has succeeded so far. Indeed, the future holds many a temptation for a young king who lives in palaces staffed with the best beauties of the realm, always eager for his attention. At any rate, Kim Jong Un has become the first North Korean leader willing to grant his wife with a measure of prominence, without any impact on the succession politics. Indeed, since 2012, Ri Sol Ju has been seen next to her husband countless times, often without the Kim badge and dressed in expensive designer clothes. 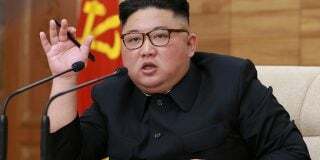 Recently, North Korean official media began to describe her using special honorific forms of words, which, historically, have rarely been applied to anybody but the ruler from the Kim family. There have been periods when Ms. Ri has disappeared from the official press, but most likely, these short-term disappearances reflected not some kind of problems in her relations with the sovereign leader, but rather her pregnancies and perhaps some health and personal issues. 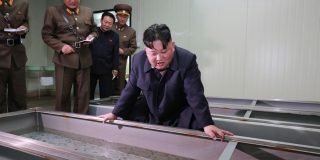 The emergence of Ri Sol Ju as a semi-public figure has been welcomed by many in the West, where there is a tendency among journalists and experts to see such prominence as a sign of emerging openness. Indeed, I remember how, a few decades ago, I read a critique of the-then aging Soviet leaders in a Western newspaper, with the journalist accusing the Soviet leaders of the Brezhnev era of being untrustworthy and secretive because they were ‘hiding their wives from the public’. Back then, the remark struck me as bizarre or comical, since it was not how me, and people around me, saw the situation at all. The Soviet people of the 1970s did not always like their system, as subsequent events vividly demonstrated, but we saw the silence surrounding the leaders’ families as something proper and natural. Indeed, the Soviet and, broader speaking, Eastern European experience, makes me far less enthusiastic about Western assumptions about the public role the leader’s wife is expected to play. In the entire Soviet and post-Soviet history, that is, in the 101 years which have passed since in 1917 Russia ceased to be a monarchy, only two leaders gave their wives public prominence. In both cases, their decision was lauded by the Western media, but seriously damaged their standing at home and, to an extent, contributed to their downfall. The first was Nikita Khrushchev, a former metal worker who rose to the heights of power in the early Soviet decades and was the First Secretary of the Party from 1953 to 1964. Unlike his predecessor, the secretive, cautious, and widowed Joseph Stalin, Nikita Khrushchev traveled a lot and was frequently accompanied by his wife, Nina. By Western standards, she did not look impressive (no designers clothes, for one), but this behavior by Nikita Khrushchev annoyed a great deal of Russians. Nina became a target of rather unpleasant jokes and was much despised in the country – even by those people who liked her husband. Nikita Khrushchev’s successors, including Leonid Brezhnev, who ran the country for nearly 20 years in 1964-1982, learned this lesson. They knew that their subjects were not going to like a high public profile first lady. They returned to the old practices and behaved pretty much like Kim Il Sung and Kim Jong Il behaved. The only difference is that the Soviet system, more egalitarian and non-dynastic, would not tolerate any Kim Jong Il-style womanizing by a top official. The Soviet leaders’ wives could be occasionally seen at diplomatic receptions which were arranged according to the Western conventions and where the wives’ presence was expected. In very rare cases they might accompany their husbands to some semi-official concert or cultural event, but always tried to keep a low profile there. Even such rare public appearances, though, were not emphasized by the media. The journalists knew only too well: the top leader’s wife should be kept out of the public spotlight, lest common people get annoyed. Mikhail Gorbachev, the most radical reformer in the Soviet Union’s history, decided to break with this tradition, and gave his wife, Raisa, hitherto unprecedented prominence. 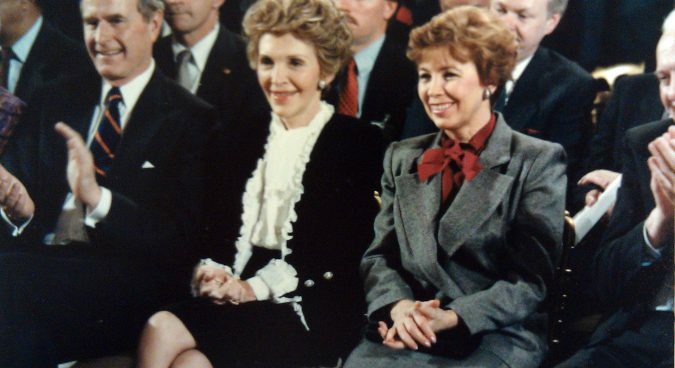 For a while, Raisa Gorbacheva behaved pretty much like one would expect an American “first lady” to behave. She was even involved with some kind of humanitarian and philanthropic projects. However, this greater prominence, in no time, produced an even greater backlash. I am old enough to testify: Raisa Gorbacheva was deeply unpopular even with the minority of the Soviet and ex-Soviet citizens who liked – or still like – her husband. Raisa Gorbacheva’s death in 1999 slightly improved attitudes towards her, but for the majority of those ex-Soviet people who still bother to remember, she was a woman who behaved in an improper and arrogant way. Before our readers feel outraged by such a reactionary Russian attitude to what the average Westerner sees as normal behavior, I would like to confess that I myself, to a very large extent, share this attitude and will try to explain the logic behind it. This attitude doesn’t necessarily reflect some kind of reactionary, let alone misogynistic, tendencies. The problem is that the Western cult of the First Lady has, to an extent, a pre-modern origin. It is a reflection of the feudal traditions, with President’s wives being a present-day equivalent of queens from the bygone days. The Soviet public felt annoyed by the high public profile of the wives of the country’s top leader because they were driven by a simple and essentially modern logic. They saw the country’s leader as someone who got their job through talent and personal qualities. The leader’s selection might be non-democratic, even outrageously so, but men like Leonid Brezhnev or Yuri Andropov had some personal qualities, good and bad, which made them the top bosses of the Soviet party state. However, this was definitely not applicable to their wives. When a Soviet citizen saw a top politician’s wife performing some public duties, they were likely to ask why this particular woman was qualified for such a job. Her only claim to fame was that she was living with some high official, sharing his flat, his bed, and to some extent, his personal life – perhaps even cooking a borsch for him or supervising a cook who did the job. However, in the minds of many Soviet citizens, including the present author, this was not seen as a sufficient ground to justify the right to act as a public figure on her own. The idea that the husband’s power, position, and privileges should be automatically transferred to his wife can be interpreted as pre-modern, archaic, and feudal. Interestingly enough, both Boris Yeltsin and Vladimir Putin have learned from Gorbachev’s experience and kept their wives largely hidden from the public, even though, bowing to the pressure of Western-style diplomatic etiquette, they often took their wives to overseas trips and diplomatic receptions. When Vladimir Putin in 2013 divorced his wife, it attracted some attention in Russia. It is now an open secret in Russia that the President has a girlfriend, whose name is widely known, but once again, it is not a topic which is discussed in media, and Miss K. is not seen next to Vladimir Putin on public events. What does it mean for Ri Sol Ju and her family? Her prominence is likely to be seen by the average North Korean pretty much the same way the average Russian used to see the prominence of Nina Khrushcheva and Raisa Gorbacheva. It might help that, judging by what is known about Ri Sol Ju – or to be more precise, about her public image – she looks like a decent and modest woman. Nonetheless, her presence is liked resented. Perhaps, contrary to what many people in Western countries believe, Kim Jong Un’s decision to promote his wife to a public figure might produce a major backlash against him, and, of course, her. I’m not saying that this backlash will determine their fate – most likely, not. 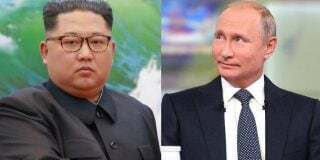 However, for any smart politician, it always makes sense to be careful: at least, this is a lesson Soviet leaders once learned from the mistakes of Nikita Khrushchev and Mikhail Gorbachev. Subscribe to read the remaining 2102 words of this article.